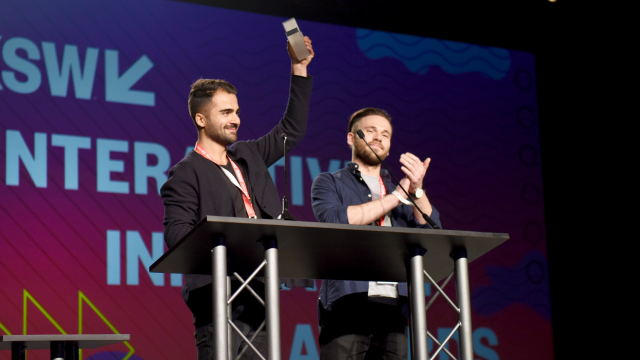 Tonight the 20th annual SXSW Interactive Innovation Awards celebrated the 2017 Finalists and Winners. Emcees Janina Gavankar and Lyndie Greenwood announced the winners of the 13 categories and 7 special honors ranging from achievements in digital design to health technology and beyond. It was a wonderful night celebrating the incredible speakers, trends, ideas, and ingenuity that came to Austin this year. Congratulations to all the 2017 winners! Awarded for the new technology that best improves the quality, efficacy, and cost-effectiveness of prevention, diagnosis, treatment and care in health and medicine. Awarded for the best new way to connect and communicate with others. Awarded for making 3D printing technology more accessible or affordable, or to the Maker using such technology in new and exciting ways. Awarded for 2017’s best device or service that changes and improves the way we listen to and enjoy music. Awarded to those redefining the exchange of goods and services, from the sharing economy, to virtual currency, to micro-finance, to mobile-device-payment systems and beyond. Awarded for 2017’s most progressive accomplishment in the way we go about securing our data and ensuring our privacy. Awarded for the coolest scientific achievement or discovery that before was only possible in science fiction. Awarded for innovations in eco-friendly or sustainable energy, transportation, and IoT technology, making life in the connected world a smarter, cleaner, greener, and more efficient Internet of Everything. Awarded for breakthroughs in augmented reality & virtual reality technology including the application of new hardware or software which truly make the Virtual a reality. Voted on by the SXSW Interactive community at the second Interactive Innovation Awards Finalist Showcase. Awarded for the best new writer’s essay, in honor of the late David Carr; our friend and great contributor to SXSW and the journalistic community, whose interest in the convergence of new media, technology, and culture inspires the essay topic for each year’s competition. Honoring those exceptional trailblazers whose work has helped shape the connected world and who continue to guide the direction of the digital industry. Most ubiquitous meme that went viral in calendar year 2016 and that we just can’t get out of our heads or off of our screens.